REGISTER SOON IF YOU ARE INTERESTED! We call this gathering "Meeting Your Divine Feminine Wisdom" because we all have wisdom to share on our journey as women. Woman's path has been laid out long ago, as archetypal energies that can guide us from birth to death. In meeting these energies this weekend, we will use information and experiential exercises to help us contact the living energies within, identify them better, and then be able to use them consciously. There are many systems the world over for identifying this wisdom: we have chosen to adapt the Greek system of the archetypal Goddess energies.. WHEN: Friday evening, August 24 through Sunday lunch, August 26, 2018. Option to attend Full Moon Meditation on Saturday evening and Alice Bailey Study Group Sunday after we conclude. FRIDAY: First session begins with a potluck dinner at 6 pm. Close at 8:30 pm. SATURDAY: Meet at 9 am and finish around 12:30 pm for a delicious provided lunch. Reconvene at 1:45 until 5 pm. Dinner provided: a simple supper. After-dinner option of joining in the EJ Full Moon Meditation at HRC at 7:30 pm. SUNDAY: Final session begins at 9 am, event closes at 11:30 am. COST: $135 for the entire weekend. Two meals included. Sorry, no drop-ins or partial attendance. MORE INFO: Maria at (575) 586-2267 or mariamikhailasart (at) gmail (dot) com. Contact Maria to register and let her know any dietary restrictions. Checks can be mailed, made out to Earth Journey. Limited to 12 participants. DEADLINE AUGUST 17 for payment to hold your place. ABOUT THE FACILITATORS: Maria Mikhailas has assisted Marea Claassen, Jungian psychologist and analyst, and been an instrumental presence for over 20 years at a majority of Marea's Divine Feminine Archetype events. Martha Shepp facilitates depth creative experiences in her teaching and coaching practices. 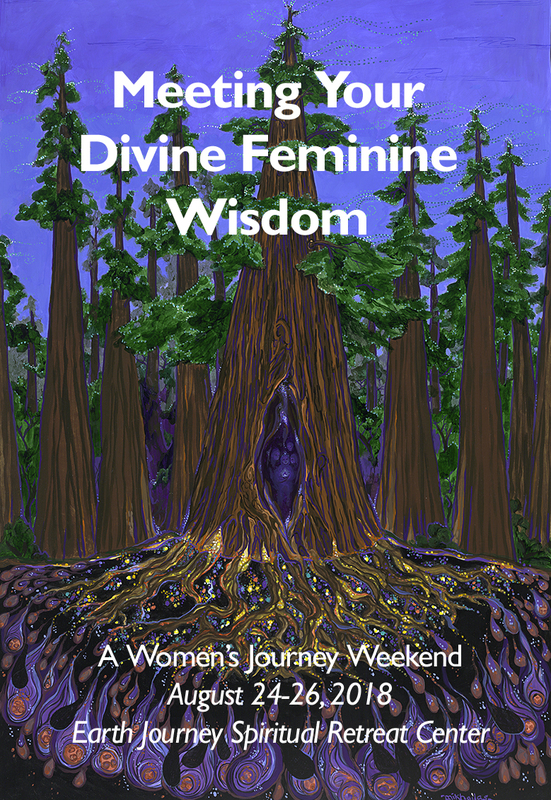 Both women are excited to activate the Divine Feminine stream that will become ongoing within Earth Journey with this retreat weekend.